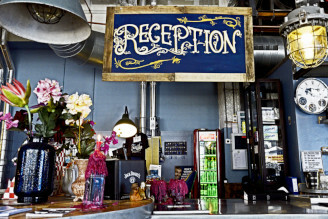 The first floor of the Blue Collar Hotel offers an excellent hostel for our guests on a budget. The hostel rooms are clean and comfortable. They include a locker, light, power outlet and a trash bin for each bed. The beds are divided over two (mixed) dorms with 12 and 34 beds and are divided by a shared sanitary installation with showers and toilets.